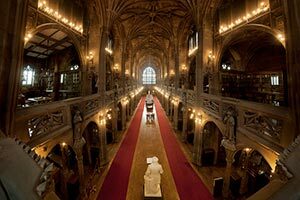 What's interesting about the library is it was founded by John Ryland's wife in his memory. She was equally interesting herself. Born in Cuba it is said she was the embodiment of grace and empathy and her caring nature made her a treasure to friends and family. The library building is of gothic design and it was completed and open to the public on January 1, 1900. 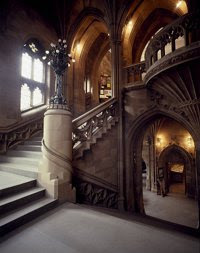 The library is now part of the University of Manchester and its exhibits showcase their special collections of rare books, manuscripts and archives. I was rather green with envy when I spotted a number of students nestled into an alcove. What a lovely, quiet, conducive place to study! Another lesser known library, Chetham's Library, is the oldest public library in the English speaking world and John and I enjoyed it so much we returned for a second visit. The man at the gatehouse (pictured below) told us the library reminded many visitors of the library in the Harry Potter films and we totally agree. The library is also home to a school for children grades 1-12 with a focus on music. Once inside the library, we're transported back into the 1650s. This is the ground floor area of the current music school. During our second visit a concert was in progress and the calibre of the music students was impressive. This was not the squeaky, simple notes of my high school band, this was perfection itself. The reading room is also virtually unchanged from the 1650s. The quiet setting includes a massive round table punctuated with a number of more private alcoves that encourages one to grab a book and inhale its knowledge! This particular alcove is where Friedrich Engels and Karl Marx met in the summer of 1845 to discuss their various beliefs that would eventually evolve into Communism. In fact they sat at this very table. Also of note is this original bookshelf - complete with books chained to the shelves as was customary in the 1650s. Note that all the spines are hidden so that to find the book you wanted to read it could be quite a search. Back at home Bella and Barney enthusiastically greeted us upon our return, but we suspect they did wonder when the people with the 'funny accents' (us!) would leave and their real owner would return. This photo was taken just minutes before it happened. The anticipation was palatable! Once again we'd like to thank Barb and Sally for the wonderful opportunity to spend a week in Manchester. We loved every minute of our stay. Please give Bella and Barney an extra biscuit each for us!